A temporary set of by-laws were drawn up immediately. Then, in 1972, the group affixed their signatures to Articles of Incorporation and the Gregory County Historical Society was officially born. However, the distance across the County was great and often created different visions for the organization. One part of the County had an older history, and there were strong rivalries between schools, so the Society was set up in different chapters governed by the umbrella County organization. In 1977, the Catholic diocese, through the efforts of Bob Malone, allowed the organization to purchase the St. Augustine Catholic Church in Dallas for $1,000 to be used as Gregory County Historical Culture Center. It was put on National Historic Registry, and over the years the Society has filled it with different historical artifacts from all over Gregory County. Now the Society regularly meets as one group in the center of the County. 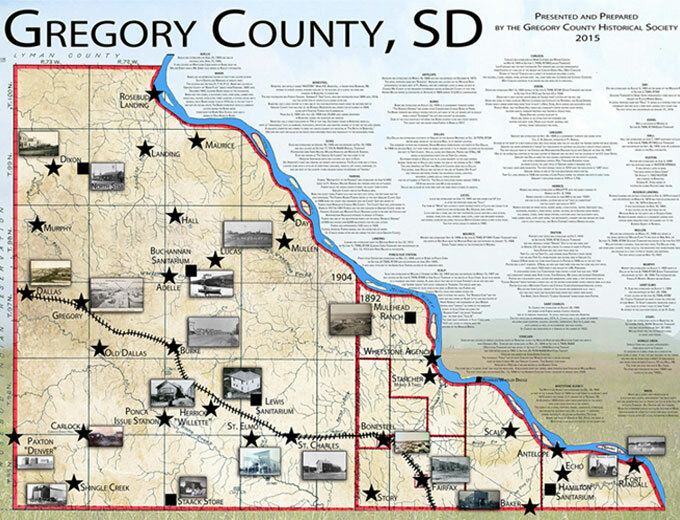 Although geography still plays a role in the dreams for the organization, shared interests bring a diverse group of people together to achieve common goals for collecting and preserving the history of Gregory County and south central South Dakota. The map is 24” x 36” and displays each original town established in Gregory County, along with a photo and description of the towns compiled by Jack Broome. You get a free map with each $20 donation and maps are available from the following people: Jack Broome (Burke); Jerry Peterson (Burke Courthouse, Register of Deeds); Clark Gies (Fairfax); Richard or Bev Rubel (Gregory/Dallas). We've provided the following button for your convenience if you wish to make an online donation. Our mission is not only to preserve and share the unique history of our area, but also to make it available to researchers and writers. We aim to be a helpful resource to anyone seeking historical information and sources. We also work hard to maintain the Gregory County History Museum, which is located in the former St. Augustine's Catholic Church in Dallas. We both preserve primary sources and artifacts at the museum and catalogue hard-to-find secondary sources. Copyright © 2017 Gregory County Historical Society. / All rights reserved.